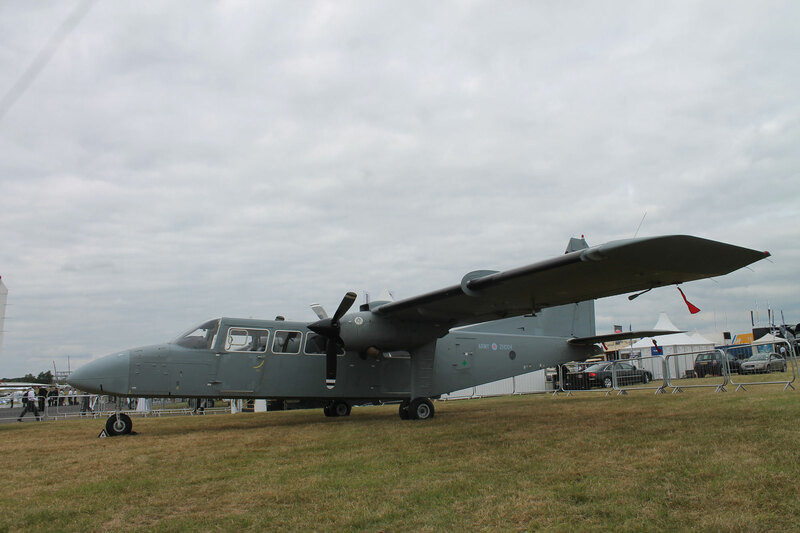 Britten-Norman is promoting what it describes as “affordable” and “entry-level” C2/ISR configurations of its evergreen BN-2 Islander and Defender twin turboprops. At the recent Farnborough Airshow, the company displayed an airframe designated BN-2T-4S, also known as the Defender 4000, that it said is best suited for the role. According to Gerry Smith, business development director, BN has produced approximately 800 aircraft, of which some 20 percent serve in military or parapublic roles. Most of these are BN-2A/B/T Defenders, with a lower max takeoff weight than the Defender 4000, which combines an extended Islander fuselage with the wing of the three-engined Trislander, a larger-capacity aircraft that was built in smaller numbers. One of two aircraft on display previously served with the Manchester Police, and retained the L-3 Wescam Mx15 EO/IR sensor ball used by that force. But Smith told AIN that BN is “agnostic on turrets,” and a signboard next to the aircraft described the merits of a rival product from Selex ES. Further, BN and Selex ES have partnered to expand the ISR capability of the aircraft. They suggest the addition of the Selex Seaspray 5000 AESA radar, mission management system and datalink to provide multi-sensor, all-weather day/night surveillance. One aircraft carried external fuel tanks and launcher rails previously manufactured by EDO/MBM in the UK, and now supplied by new owner Exelis. One rail was fitted with examples of the Thales FFLMM, a small free-fall weapon derived from the same company’s lightweight LMM missile. Thales revealed the new weapon at the show. Smith said that BN plans to conduct firing trials. Other options for the hardpoints included resupply pods or illuminator flares, he added.